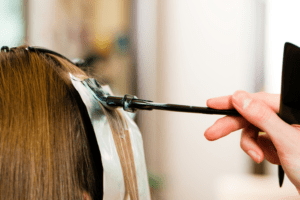 Hair Salon Burn Injury Lawyers | Simmons & Fletcher, P.C. There are many hair styling procedures that a commonly performed using chemicals that can cause severe perm burn injury to the scalp if they are not applied by your hair stylist carefully and safely. The “Brazilian Blowout” is probably the most well-known hair procedure that can leave perm burns if not performed correctly. It is also known as: Brazilian Hair Straightening Perm, Brazilian Keratin Treatment, Coppola Keratin Straightening, Keratin Complex Treatment, Liquid Keratin, and Global Keratin. Other beauty shop procedures that may result in scalp burns may include hair bleaching, hair lightening, hair dying or hair straightening perms a/k/a “relaxing perms. The burns can range from minor burns to third degree burns that cause permanent scarring and hair loss. If it is allowed to get in the eye, it may result in permanent blindness. Sadly, most of these burns are preventable simply by following the safety directions on the container. Why Do Perm Burns Occur? There are several reasons perm burns may occur. First and foremost, the chemicals being used are known to have toxic properties. Chemicals such as lye, formaldehyde and calcium hydroxide can cause severe scalp burns if not handled with care. There is a reason your cosmetologist wears rubber gloves and pulls the hair through a protective cap or wraps it in foil to prevent the chemical from touching the skin. Performing a hair strand test before doing the whole head is a simple way to prevent scalp burns. Second, people can have allergic and/or toxic reactions to the chemicals. Chemicals and minerals in your hair and scalp may have an adverse reaction to the chemicals used in the hair care procedure being performed. Many of the chemicals used in these products have Material Safety Data Sheets—documents required to be filed with the government when potential hazardous and/or toxic chemicals are being used. The important thing to understand is that these reactions are known to occur sometimes when you get your hair permed or relaxed. A trained hair care professional should be aware of these known risks and of the importance of following the manufacturer’s safety instructions included in the product information. Many of the harmful reactions can be avoided by performing a simple hair strand test—a procedure by which a small amount of chemical is applied to a few strands of hair to see if there is any adverse reaction. Failure to perform such a test on a known dangerous hair care product is negligence on the part of the hair stylist. Lastly, even thought these products have claimed to be “formaldehyde free” in their labeling, some of them are misleading. Many of them, when heated with a blow drier, release formaldehyde. The Federal Drug Administration has gone after companies for years and there has even been a class action over this. Formaldehyde is a chemical known to cause skin irritation and severe burns. Knowing that these products can result in burns and are often not properly labeled, your hair-stylist should realize the importance of a strand test. Is Your Hair Care Professional Informed? you have recently had other hair procedures or treatments done that could adversely react or impact a perm. seek emergency medical care if you feel a burning sensation to your scalp. If your salon stylist does not discuss these matters with you, you should seriously consider going elsewhere. If you have a procedure done and these symptoms appear, you should seek medical attention immediately. We do not currently handle product liability cases against manufacturers of home perm and other hair care products where the application is not performed by a professional stylist. After you have sought the appropriate level of medical care, you should consult a hair salon perm burn injury attorney immediately to determine your rights. It is very important that you act quickly in a case such as this to preserve evidence. The hair care product involved may be disposed of if you fail to act quickly making determining exactly what went wrong more difficult. At Simmons and Fletcher, P.C., we have recovered substantial settlements for clients suffering from severe hair burns. Call us for a free consultation on your case today. 1-800-298-0111.